Shades of Us: CHILDREN SHOULD NOT HUSTLE! 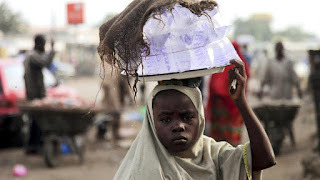 Young girl hawking sachet water. The little girl ran up to me, somehow balancing the crate of boiled eggs on her head and trying to keep her falling wrapper in place. Her feet were clad with slippers that were well worn and designed with holes. She couldn't have been more than eight years old and as she reached me, the smell of her unwashed body repulsed me more than she could have imagined. As she raised her head to ask if I wanted the eggs, I had a full view of her face. She was made up, with a haphazard line was taking center stage on her brows. Her eye pencil was dripping, making her lower lid look heavy. Her powder was in patches, with more shades of grey on her dark skin than there was on a wiped chalkboard. Her pouty lips were made more so with the red lipstick she wore and the very black liner she used to line her lips. She was wearing a torn Hijab made of a print material. The Hijab was bunched at her shoulders as she held the tray that held the crate. Her skirt was a different print from her top though they were similar in one way; they were both threadbare, dirty and reflected just how poor she was. I took all these in as she advertised her eggs. The makeup, dirty clothes, torn slippers and the over coat of unwashed funk all reflected one thing: poverty. 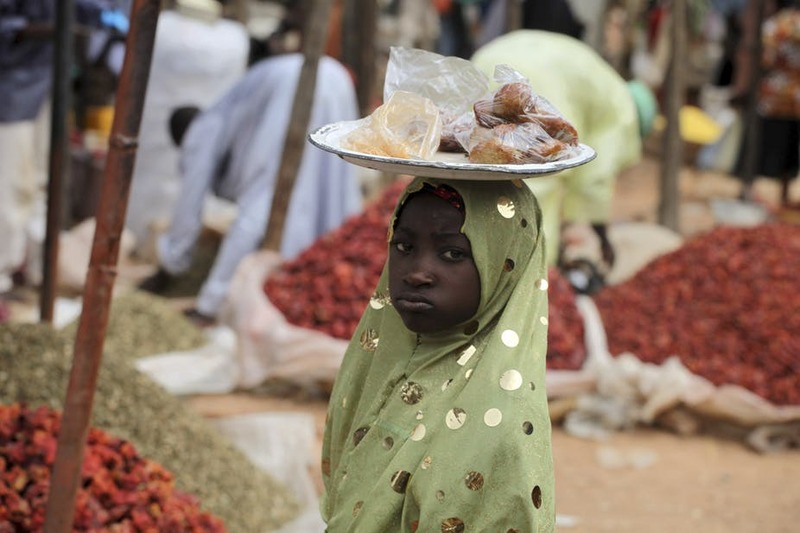 In one glance, I could tell that this young girl was forced into child labor. It didn't take Einstein to figure out that this little girl was doing this to make money for her family. She was probably going to walk up and down the town in her quest to sell the eggs. The more eggs she sold, the more likely her chances of eating something that night. If she returned the eggs home, she was most likely going to sleep hungry. As I continued to look at her, imaginations of how hungry she might be kept flicking through my mind. Though her smell repulsed me, I was drawn to her in a way that was against my personal principle. I was torn. A common sight in many African communities if the presence of child hawkers who are working to sustain their families. You see, when I was in primary school, I had a teacher called Mrs. Williams. She died. But before she did, she had imparted so much in me that I owe some of my life's principles to her. She urged us always to be the best and always had little quips that stayed with us; with me. On one of such occasions, after a field trip to the airport, she said something that stayed with me till this very moment. As the school bus slowed at a traffic jam, some children ran up to it to display their wares. From candy popularly called ‘alewa’ to groundnuts and what not, these kids had enough to attract our attention. Many kids started pulling out their lunch money to get things and only refrained when Mrs. Williams bellowed. Thankfully, the traffic jam lessened and we got going. That was not before we saw the disappointed looks on the faces of the children as they saw us go. We had been their hope for some money but Mrs. Williams crushed that hope. I was, for the first time in my young life, furious at her. When we got to school, I was still furious. As we settled into our seats in class, Mrs. Williams demanded our attention. When she got it, she started teaching us about child labor and abuse. She told us it was wrong to send kids to the streets to hawk. She asked how we felt knowing our mates were hawking on the streets and highways when we were in class, learning and getting an education. In truth, we didn't understand what she was saying – we were just in primary three – but the passion with which she spoke hit me. The message I got that day was that children shouldn’t work when they should be in school. As little as I was, I felt bad that I could afford to be in school while others were out there fending for themselves and their families. I really cannot remember if that was when I made the choice to never buy something from a kid but I know that as I grew up, my resolve strengthened. My ideology was that, as long as we buy things from kids, we were also promoting child labor. I felt that if children went home every night without selling anything, then their parents would be wise about sending them to the streets. At that time, all of these made great sense to me. As I grew older, I realized that the ideology I had was hard to keep, especially as child labor came closer to home. A close friend of mine, whom I will call Williams, had to work to make ends meet. Williams came from a comfortable family. He had two brothers and one sister. They had most of what they wanted. They ate right, dressed well and even went to good private schools. The fairy bubble burst when his father lost his job after the Kaduna textiles closed down. They were tiding over until they just couldn't keep up the pretext anymore. They had to move to a much smaller house and even sell most of their stuff. After a while, his father travelled to find work and was not heard from for months. They had absolutely no idea where he was or even if he was alive. His mum had to pick up the mantle of leadership to keep the family going. She got a job working as a cleaner in a school where the pay was barely enough to cover utility bills. Gradually, they had to be pulled out of school. The mum was a beehive of activity: closing from her 8-4 job to come home to prepare pap for sale. Soon, the bills were overwhelming her and she had to engage her kids in the labor market. She sent Williams and his brother to go be bus conductors and made their sister hawk the pap. I remember being furious with her and voicing my sentiments to Williams. After I had nagged him for a bit, he told me that I was one to talk because I had my parents provide all I wanted. He told me to see if I would hold on to my ideologies if my mum had to scrape and beg and age due to stress just so I could eat once a day. At that, I clamped my mouth shut, never knowing that things were so bad in his house. I could talk ideologies from now till the Lord's coming and it would not mean anything if a person couldn't eat or didn't have a roof over their heads. More recently, my friend Kallie and I were at the market when this little boy selling sachet water walked past us. We really didn't notice him at first until he walked past us say, maybe three more times. The fourth time he passed us, we realized he was crying. He was a picture of dejection and I felt a tug in my heart. Kallie called him. She asked what was wrong and he told her he lost his money. She asked how much it was and he said two hundred naira. My friend looked at me and I returned the look. This little boy was crying because he lost two hundred naira; two hundred naira that was airtime money for some, or little change for another. But to that boy, that money was the world. I knew he was crying because someone was probably going to whup him for losing that money and most likely starve him of his only meal of the day. My friend looked at me and we both pulled out one hundred naira each from our purses and handed to the boy. He didn't say 'Thank You'. He just collected the money and walked off...or he might have if my friend hadn't pulled him back. She chastised him for not being appreciative until I pulled him away and told him to go. I told her to let it go. My view was simple: if the boy had to work the streets just to get a meal, what made her sure his parents (if he had any) were bothered about teaching him social etiquette. As a result of this, I prepared to talk on child labor on our breakfast show. I got guests in the legal profession and people who worked to ensure the implementation of the child rights act. We had a great discussion and when we engaged our listeners, most people condemned child labor but excused it on the economy. They were of the opinion that if the economy was better, parents wouldn't have to send their children out into the streets. In essence, it was noble and good to care about children but the government just didn't care. I left that interview session unfulfilled because I felt that as long as people could blame the government, child labor will never be stopped. And that makes me worried. As I looked at the egg seller in front of me, my mind still screamed that children shouldn't be working. Children shouldn't have to brace the streets to earn a living for their parent; they shouldn't have to be exposed to human and other forces that are sure to destroy their childhood essence. Child rights laws need not only be seen on paper and rehashed every Children's Day but should be implemented and supervised thoroughly. Child rights laws should not be paper statements that hold no water. Kudos to the United Nations but more can still be done. How do we protect these children from the effects of working the streets? The little girl got bored with me and left, taking her next meal ticket with her. She sought out other customers and got called by one, who, ironically, was a police officer. I stood there and watched him buy two eggs and, having peeled off the shell, tell the girl to sprinkle salt. What was more striking was that he kept 'pricing' the eggs, refusing to pay her the N40 she was asking for each. After haggling for a while, he gave her N60 and told her to buzz off. She shook her head, raised her tray to her head, and continued the hustle. The same person who should have been protecting her from child exploitation was the very person who was exploiting her! I turned away from the scene and went home. Children cannot stand on their own in the face of child labor, but clearly neither can the parents who are forced to put their children on the streets. 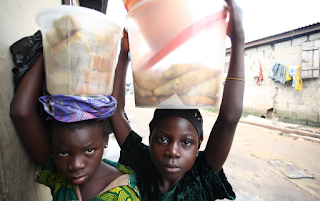 We can talk about the economy all we want, but child labor is a societal problem that only the society can fix. The government isn't some all-seeing, out-on-the-streets lens watching these young people slave away. But we can see them. And their silent screams cannot go unheard. Truth is, I cannot stop child labor. I may not even be able to reduce it drastically but I can (and will continue) to speak against it. I want to plead with people to stop buying things from children. I still hold the view that if children don't make any money when they are forced to work, their parents will stop sending them out to the streets. If we boycott all forms of child labor, maybe this problem will be pulled from the root; because this bud has become a full blown tree. I'm one person standing for the protection of the children. Children shouldn't have to hustle! This is hoping someone listens...and acts! Lovely piece! Its sad that a police officer who should be protecting chose to abuse just as legislators who should hurriedly pass the child rights act in state assemblies are towing with it. I hope that the 5th Assembly will live up to the responsibility of passage & implementation with citizens & civil society mounting pressure. This here points us in that direction. ''My view was simple: if the boy had to work the streets just to get a meal, what made her sure his parents (if he had any) were bothered about teaching him social etiquette'' - this statement struck me and it's just the the obvious truth. More so, this children grow up uncultured and tends to be threats to the society due to the hatred that lives with them. Thanks @Kada and @Shade. We need to spread the news and do what we can to stop this!